Outside of guys like Ted Nugent, Gene Simmons and Lemmy Kilmister, it seems like rock 'n' roll currently has a shortage of musicians truly shooting from the hip. Whether it's simply another symptom of the politically-correct world we're living in or not, people aren't as outspoken as they used to be. 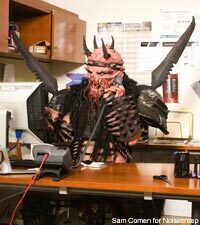 It's a good thing we still have Oderus Urungus around. The Gwar frontman has never been one to hold back his verbal venom, and -- even though the long-running intergalactic metal mongers are celebrating their 25-year anniversary this year -- their singer doesn't seem to be cutting down on the vitriol. Urungus recently stopped by the West Coast branch of the Noisecreep offices, and we're still recovering from the visit. The singer was there to promote Gwar's new 'Lust In Space' album, but he had a lot more that he needed to get off his chest. In the exclusive video interview, we shot over a list of topics that ranged from his thoughts on the screamo scene, groupies, their recent visit to Comic Con and the Finnish band Lordi. If you've already seen the cover art for 'Lust In Space,' you probably noticed the close resemblance to 'Love Gun,' the seminal 1977 album from Kiss. We asked Urungus if he was afraid of a lawsuit. But as you'll see, he doesn't seem to be all that concerned.